Hope all had a Merry Christmas...We did....besides the fact half of everyone kept passing the stomach flu around..All of Perry's siblings (7 besides him) came into town and I think at least half of everyone got sick at some point during the week. Poor Perry got it twice for our family. (Luckily I never got it or the kids) Besides everyone being sick we had alot of fun though. It was great to see everyone and we had the privilege of having his oldest sister Chanel and her family stay with us for a little over a week. We had fun staying up late watching movies and playing kinect. Chanel put together a "Night at Bethlehem" where everyone dressed up and got gold coins to purchase food that would have been eaten during Christ's time, and we also had a little program. One night we played wallyball and another night we played elimination at the church. It was great to see everyone and hang out. Now that everyone is gone the kids and I don't know what to do with ourselves...Its back to our boring "real lives" I guess.. Here are some pics! The kids had fun helping us put ornaments on the tree. When we were in Utah for Thanksgiving we went to temple square to see the lights. 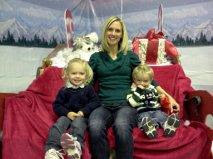 Perry and I missed the ward party so we took them to the rec center to see Santa. 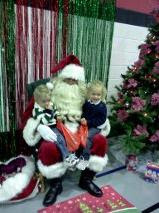 Logan told Santa she wanted "something special" for Christmas. I have no idea what "something special" is..... These are taken with my phone-so crappy quality. Here's the boys playing dance-kinect. It was so fun and so funny to watch!! Tubing at Hesperus. The kids loved it.. Here's my fat man in a "little coat"
Hope everyone has a great New Year!!!! Can't believe my baby is 2 already..I still think of him as my baby-but he is far from a baby anymore...He is definitely a little boy now-and "all boy." I feel bad because I didn't do a big party for him. The timing was off and it just never worked out. (what was I thinking having a December baby?) Anyway-we had a party with our little fam. I made him a baseball cake that looks terrible. (the icing was too thick- don't look very close:)) He opened his presents and loved all of them...He is really a cutie and we love having him in our family. Here are some pics-but they are taken with my phone so they didn't turn out very well. 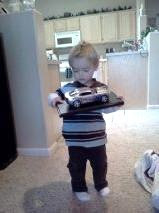 One of his favorite presents was this camero from Pappy. Here are some things that I want to remember about Cache at 2. - He is really into Cars right now. Especially Mater and Lightning. LOVES THEM so much they are his cuddle buddies at night. As I said before he also loves cameros. When we pull into the dealership he points them out right away. "Look mom, Camero." Totally cracks me up.